In Artificial intelligence, the purpose of the search is to find the path through a problem space. There are two ways to pursue such a search that are forward and backward reasoning. The significant difference between both of them is that forward reasoning starts with the initial data towards the goal. Conversely, backward reasoning works in opposite fashion where the purpose is to determine the initial facts and information with the help of the given results. The solution of a problem generally includes the initial data and facts in order to arrive at the solution. These unknown facts and information is used to deduce the result. For example, while diagnosing a patient the doctor first check the symptoms and medical condition of the body such as temperature, blood pressure, pulse, eye colour, blood, etcetera. After that, the patient symptoms are analysed and compared against the predetermined symptoms. Then the doctor is able to provide the medicines according to the symptoms of the patient. So, when a solution employs this manner of reasoning, it is known as forward reasoning. The inference engine explores the knowledge base with the provided information for constraints whose precedence matches the given current state. In the first step, the system is given one or more than one constraints. Then the rules are searched in the knowledge base for each constraint. The rules that fulfil the condition are selected(i.e., IF part). Now each rule is able to produce new conditions from the conclusion of the invoked one. As a result, THEN part is again included in the existing one. The added conditions are processed again by repeating step 2. The process will end if there is no new conditions exist. The backward reasoning is inverse of forward reasoning in which goal is analysed in order to deduce the rules, initial facts and data. We can understand the concept by the similar example given in the above definition, where the doctor is trying to diagnose the patient with the help of the inceptive data such as symptoms. However, in this case, the patient is experiencing a problem in his body, on the basis of which the doctor is going to prove the symptoms. This kind of reasoning comes under backward reasoning. In this type of reasoning, the system chooses a goal state and reasons in the backward direction. Now, let’s understand how does it happens and what steps are followed. Firstly, the goal state and the rules are selected where the goal state reside in the THEN part as the conclusion. From the IF part of the selected rule the subgoals are made to be satisfied for the goal state to be true. Set initial conditions important to satisfy all the subgoals. Verify whether the provided initial state matches with the established states. If it fulfils the condition then the goal is the solution otherwise other goal state is selected. The forward reasoning is data-driven approach while backward reasoning is a goal driven. The process starts with new data and facts in the forward reasoning. Conversely, backward reasoning begins with the results. Forward reasoning aims to determine the result followed by some sequences. On the other hand, backward reasoning emphasis on the acts that support the conclusion. The forward reasoning is an opportunistic approach because it could produce different results. As against, in backward reasoning, a specific goal can only have certain predetermined initial data which makes it restricted. The flow of the forward reasoning is from the antecedent to consequent while backward reasoning works in reverse order in which it starts from conclusion to incipient. The production system structure of the search process facilitates in the interpretation of the forward and backward reasoning. 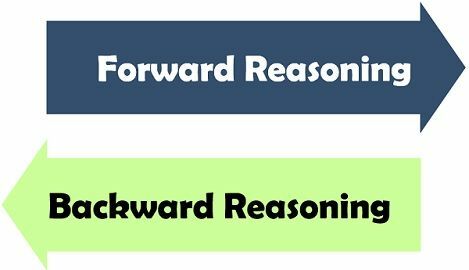 The forward and backward reasoning are differentiated on the basis of their purpose and process, in which forward reasoning is directed by the initial data and intended to find the goal while the backward reasoning is governed by goal instead of the data and aims to discover the basic data and facts.